Even as media in myriad forms increasingly saturate our lives, we nonetheless tend to describe our relationship to it in terms from the twentieth century: we are consumers of media, choosing to engage with it. 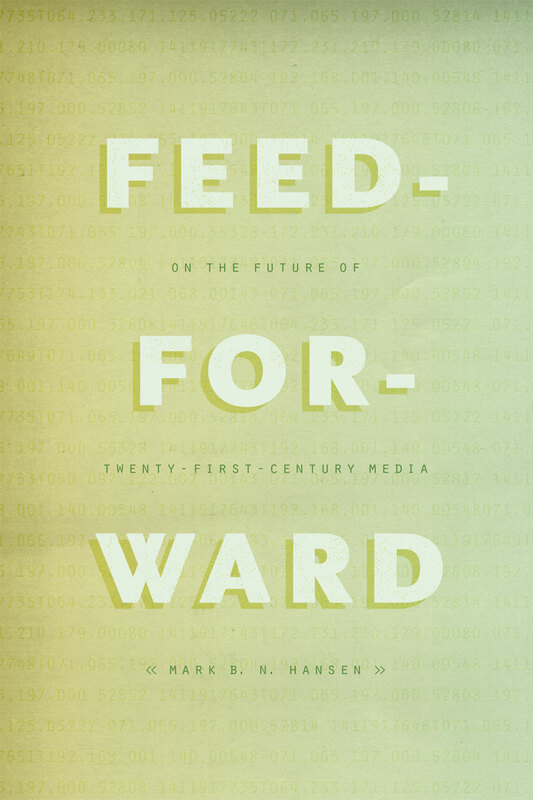 In Feed-Forward, Mark B. N. Hansen shows just how outmoded that way of thinking is: media is no longer separate from us but has become an inescapable part of our very experience of the world. Drawing on the speculative empiricism of philosopher Alfred North Whitehead, Hansen reveals how new media call into play elements of sensibility that greatly affect human selfhood without in any way belonging to the human. From social media to data-mining to new sensor technologies, media in the twenty-first century work largely outside the realm of perceptual consciousness, yet at the same time inflect our every sensation. Understanding that paradox, Hansen shows, offers us a chance to put forward a radically new vision of human becoming, one that enables us to reground the human in a non-anthropocentric view of the world and our experience in it. Introduction: Whitehead as Media Theorist?